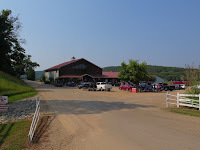 Saturday we drove just south of Sullivan, Missouri to join 15 others from Jim's company on a float trip. Several people chose canoes as their flotation devices, and a couple of people who had small children along took advantage of the double kayaks. The rest of us selected single kayaks, which ended up to be a good call. 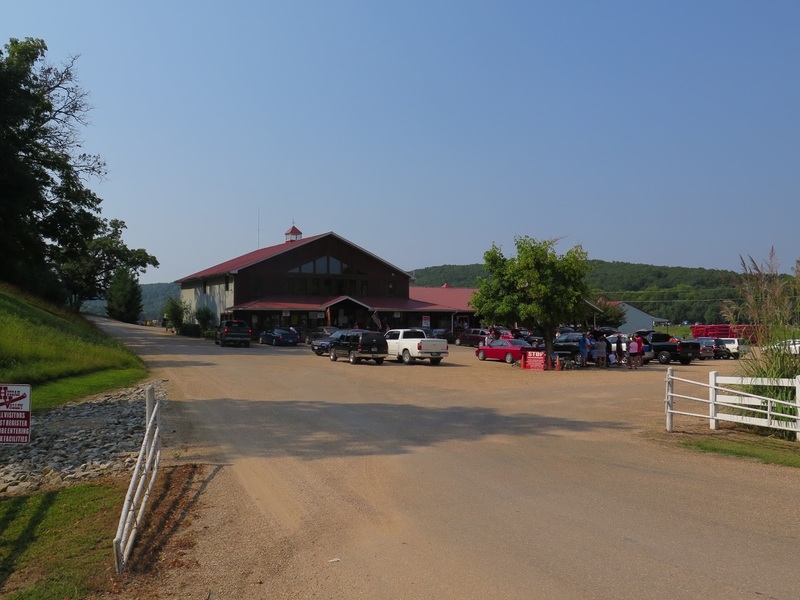 Despite the heavy rains this spring and early summer, the Huzzah River was quite low. I have decided it is just not possible to gracefully get out of or into a kayak, so I was grateful I only had to do that a few times to get over the especially low areas of the river. We had packed lunches, so we stopped on a sand bar (more accurately a rock bar) to eat along the way. The scenery was beautiful and the river was not crowded, so I really missed my camera which I left in our cabin while we floated. Going on my Christmas list this year is a waterproof bag so I can bring it along in the future. I didn't even take my phone out of town with me as there is no cell service at the camp ground. Back at our camping area, we hung out for a bit before striking up the grill for chicken shish kabobs. Four of us shared one of the A-frame cabins, and everyone else had tents. The food was cooked outside our cabin since we were the only ones who had a refrigerator, albeit a half-sized one. We were intrigued by the fact that the two A-frames next to us were occupied by ten guys and one gal. The stories we came up with were probably way more exciting than what was actually going on in the two cabins. After dinner we went down to the tent camping area and sat around a fire. Again, we were blessed with the weather as it was cool enough to enjoy a fire. Breakfast the next morning was cooked over the fire pit, then everyone packed up and headed on their way. 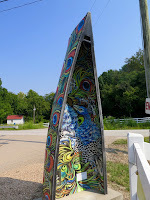 Jim and I stopped in Sullivan as they have painted canoes along the main street. I have heard about them, so it was fun to be able to snap some pictures. What a fun way to play off of the fact that the area is known for being a great place for float trips! I just can't make this stuff up. Tuesday afternoon a storm blew in, complete with high winds and heavy rain. I heard a thunking noise outside the house and immediately knew what had happened. After all, I have already had two trees fall down within three months so far this year. The sound had come from the back yard, so I cautiously peeked out the bedroom window. 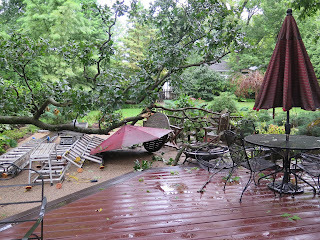 A large oak limb had broken off of one of our trees, smashing onto the patio. I offered up a thankful prayer that this time only our property had been damaged. Or so I thought. Once the rain let up, I threw on a raincoat and took my camera outside to survey the damage. Crap! The limb caught part of the neighbor's fence in addition to busting some of our stuff. This would be the same neighbor whose car was totaled when one of our trees fell on it Good Friday. He and his wife were out of town all week taking their oldest child off to her freshman year of college. We have not had a chance to discuss the latest calamity yet. We had a bid for the tree removal on Friday (the earliest they could come out due to all the storm damage), and today all the debris was removed. 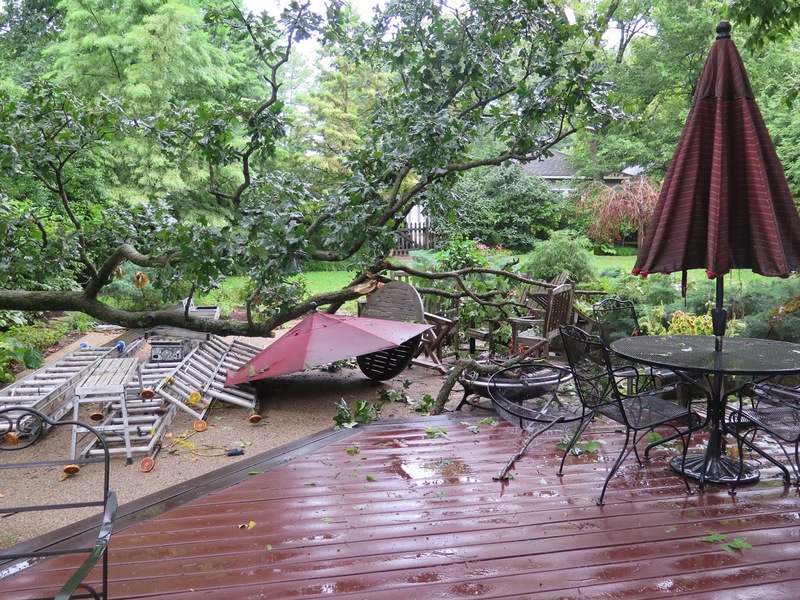 One of the table umbrellas was busted up, as well as the slats on one of the wooden chairs, but remarkably that was all the damage that was done to our property. The painters (who are still here, by the way) had a stack of ladders on the patio, and one of their ladders was bent. It may be repairable, I don't know. 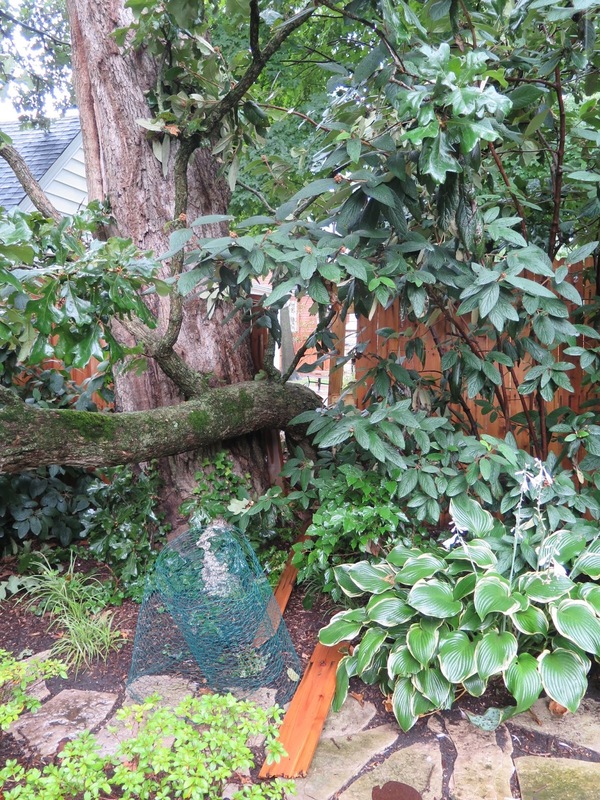 The ladders probably saved our actual patio surface from being damaged by the limb. One section of the neighbor's fence will need to be replaced as far as I can tell. We continue to endear ourselves in the neighborhood, one tree at a time. The tree professionals said that the drought we had in recent years caused the trees and their limbs to weaken. When we have a wet spring like we did this year, the trees produce an excessive amount of leaves so in a heavy storm the limbs (or entire tree) just give out. That certainly makes sense. This latest tree incident is complicated by the fact that honey bees are living in the tree. They are protected, so the tree cannot just be arbitrarily removed. The hive has to be saved first. We are having an independent arborist come and look at the tree to see if it can be saved, or if there is other damage that might cause further problems for us - and the neighbor. In other news, we celebrated our 37th anniversary Wednesday by playing pickleball. We decided we wanted to do that since we had to miss Sunday night as we were out of town. We have been playing every Sunday and Wednesday. We went out to dinner Thursday night instead. Webster Groves has a new restaurant called the Sushi Station. While I am not too keen on sushi, I knew they had other things on the menu I would like. I tried the Chicken Teriyaki and Jim had the Salmon Teriyaki. They were both excellent! It was an added bonus that we each only ate half of our meals, so we had leftovers for lunch the next day. We definitely will go back and try some other things. If we have any money left after paying the painters and tree company. Ha! Lake Panorama was the setting for my father-in-law's recent birthday. 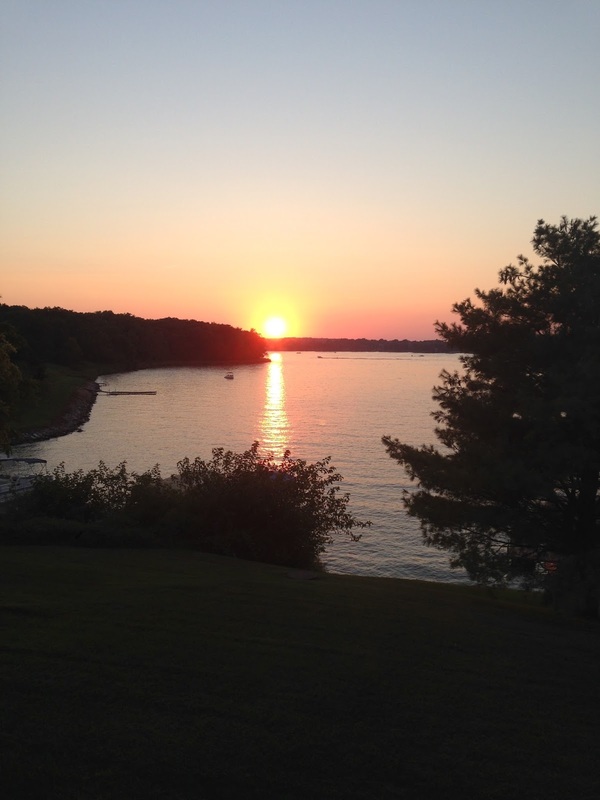 A beautiful private lake in central Iowa, the location is perfect for gathering the family together for special occasions. A friend of Jim's sister owns a condo on the lake, so most of the family stayed there. Jim and I slept at the local no-tell motel. It is nothing to write home about, but it is the only choice in the area. The bed and breakfast where we stayed a couple of years ago has since closed, sadly. I will give bonus points to the golf resort that owns the motel as they have striped one of the tennis courts for pickleball, so Jim and I were able to get a little play time in. Both of Jim's sisters were able to make the trip this year, so all three kids were there. We had a wonderful time playing games, eating too much great food, going for boat rides and just sitting on the deck overlooking the lake. I just wish that our kids would have been able to come. It is a bit hard to get to from Los Angeles and Washington, D.C. Even for us it is a 7 hour drive. When we left the lake Sunday afternoon, we drove to Des Moines to visit a fraternity brother of Jim's. Steve was in our wedding, and Jim was in Steve and Ann's wedding (both of which took place 37 years ago! ), and I am so happy that we have kept in contact with them throughout the years. Ann was out of town, but it was fun catching up with Steve. Monday morning we went to downtown Des Moines for a bit before heading out of town. I particularly wanted to see the John and Mary Pappajohn Sculpture Park (no relation to Pappa John's Pizza). 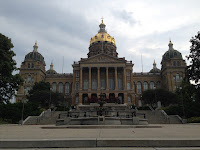 A number of my Facebook friends from Des Moines have posted pictures of it, and I was eager to see the park first hand. 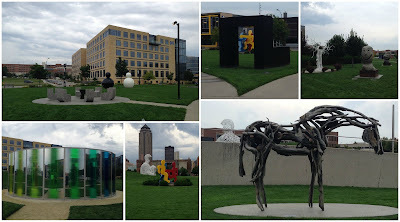 It did not disappoint, and next time I am in Des Moines I want to go in the evening when the sculptures are lit. I should probably point out that Jim and I managed to forget every single camera that we own at home. Unbelievable! Thank goodness for smart phones with cameras! As is evident from the photos, the sky was pretty threatening on Monday. The drive home from Des Moines was not the most pleasant we have ever experienced. While on Highway 163, which thankfully is four lane, the skies opened up. I have never driven in rain such as this. I pulled over on the shoulder multiple times, along with 75% of the rest of the drivers. The rain was coming down sideways, with little visibility. We finally drove out of that and were clear until just south of Hannibal where another downpour awaited us. We were pretty happy to get home in one piece. The bad drive could not negate the wonderful weekend we had visiting with family and friends though. It is all about making memories. The last time that we had our entire house painted was eleven years ago. Unbelievable! 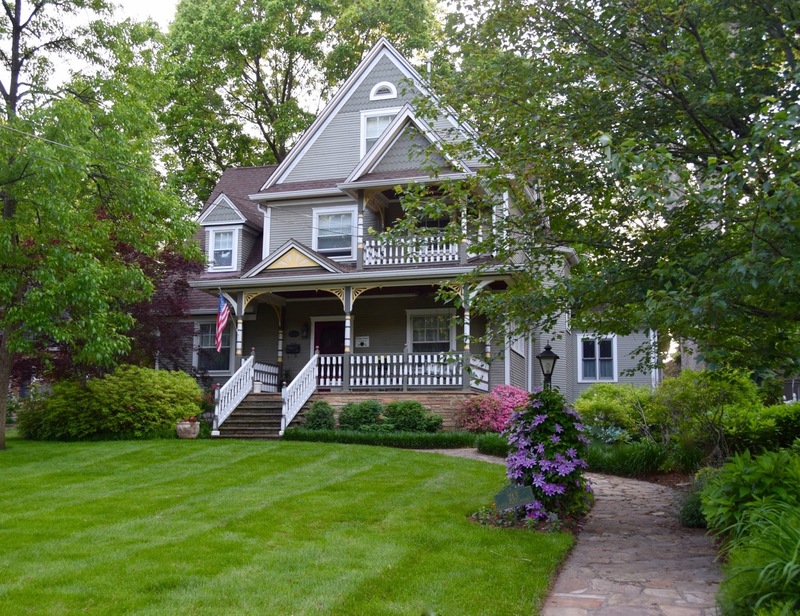 We hired a company that specializes in old houses, and they know how to prep an aging lady for her face lift. The paint held up great, but around a year ago the handrails began to rot. We purchased all the wood pieces for the 2003 remodel of the front porch from Vintage Woodworks, a company that caters to the Victorian era house market. When we contacted them, they blamed the painter. And of course the painter felt that the wood failed. The proverbial he said, they said. 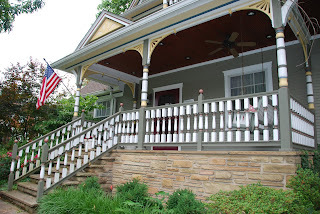 We ended up having a local contractor rebuild the railings, so it seemed timely to paint the house once those were installed. We hired the same painting company as last time, and hope we get the same long-term results. When the house was painted in 2004, we selected eight different paint colors. Because that was suchan arduous process, we are keeping the same color palette. We loved it, so why mess with a good thing? We are now in week three of the process. The first six days were sanding and scraping, followed by power washing the house. I was so relieved when that was done! The work is coming along, and the entire house has been primed and the base coat applied to the siding. The trim colors are complete, with the exception of the front of the house. That will be more time consuming as there are many spindles to paint, with multiple colors going on each one. We had some big excitement on Tuesday morning. Around 11:30 the truck of one of the painters was stolen from right out in front of our house. Three of the painters were parked in a row, and his was the middle vehicle. Now, I have to admit that he had left his window down and the keys in the ignition, but how ballsy to steal the truck in broad daylight with so many men around! Plus the neighbor across the street had a contractor parked in front of his house, and he was in and out carrying items from his vehicle to the house. An eye witness caught a glimpse of the perp, and the police were called immediately. I was somewhat optimistic that the police would catch him on Interstate 44, but unfortunately that did not happen. Instead, they caught two of them with the stolen truck last night in the City of St. Louis while they were in the process of robbing someone. The truck was impounded, and from what the painter was told the back window had been smashed, and his tool boxes were missing. He doesn't know how much other damage was done to it. I feel so bad for him as he just had one last payment to make on the truck. All I know is that these criminals are getting more and more bold. And our painter now gets to play the adult version of Hot Wheels. It is no secret that I like to take photographs in cemeteries. I love to look at the workmanship of the headstones, and find myself wondering about the people buried beneath them. Cemeteries are often so peaceful and quite beautiful. Did you know that cemeteries were the first public parks? As fewer people are choosing to be buried in the traditional fashion, cemeteries today are finding unique ways to bring visitors back through their gates. For example, Bellefontaine Cemetery in St. Louis offers Beer Baron Tours, where a guided tour leads you to all the brewery heads who are buried in their cemetery. As a genealogist, I am so appreciative of the volunteers who contribute photographs of cemeteries and headstones to the websites findagrave.com and billiongraves.com. I have been able to locate the gravesites of many of our relatives through them. So I don't know why it never occurred to me to volunteer to take photos at cemeteries in the St. Louis area. Visitors to the above-mentioned websites can put in requests, providing as much information as they have on the deceased, and volunteers can then "claim" the request. You then have two weeks to post the photos or list a problem if the stone cannot be located. Last weekend I decided to claim a few graves at Sunset Memorial Park and Mausoleum, as well as one at Father Dickson Cemetery. For the graves at Sunset, I had the section numbers as well as the lot numbers for each of the requests, so I was not anticipating any problems with locating the stones. That was a grave assumption on my part. This cemetery has no other identifying markers within each section, so there was no way to know where grave 304 was located within Section 1, for example. Unfortunately the office was not open, despite the posted Saturday hours. Unless I wanted to walk the entire section looking at the names on each headstone, I realized that this would be a futile effort on a 90 plus degree day. From there I headed on over to Father Dickson Cemetery in Sappington. This historic cemetery was opened in 1903 as a final resting place for African Americans. Due to segregation, African Americans were not allowed to be buried in any of the existing cemeteries in St. Louis. The cemetery represents 167 years of history, with the last burial taking place in the 1990s. After falling into disrepair, the cemetery is now cared for by a dedicated group of volunteers who are working to restore the 13-acre tract of land. Fortunately one of these volunteers was on-site when I arrived, as I did not know the section or grave number of the man I was researching. I had his birth and death dates (and knew that he had been murdered! ), but not where he was buried. The volunteer provided me with a very interesting overview of the history of the cemetery, and then told me that he has the record book for the cemetery at his house. I later emailed him the information about the man I was searching for, and unfortunately I learned that there was no headstone for this individual. However, the volunteer did provide me with details such as the fact that the man had died in City Hospital #2, the date of burial and the exact location of the grave itself. As a genealogist, all the little bits of information help to paint a picture of your ancestor's lives. So at least I could pass all this along to his descendant even if I couldn't provide her with a photo of a headstone. The moral of the story is to only accept assignments when the location of the burial plot is provided, and where the cemetery has a map so that I stand a fighting chance of being able to find the grave.